I’m still a long way off from being able to share individual room reveals from the new house, but I am making progress! This week I got to bring home some of the art my sister painted for me, my bedding from Matouk arrived, I received my headboard, bar cart and should be getting my credenza for my office today! I obviously did not order all of these things at once, but they seem to be trickling in around the same time. While I can’t show you the rooms yet, I thought it would be fun to share a peek into the spot I spend most of my time: the home office. When looking for a home last year, I knew I wanted a separate, dedicated space for me to do all of my work. At the townhouse I worked at my dining table (there was no extra space for a desk), which as you can imagine, wasn’t organized and was an eyesore for anyone who ever came over. In addition to a bunch of legal/business-related documents (and receipts to keep track of! ), I have quite a few coffee table books, which I again didn’t really have a place for at my previous abode. I also had all of my camera and computer equipment strewn about everywhere. Needless to say, storage was high on my list of priorities! To make the space really feel like an office, I decided I wanted a pair of bookshelves where I could feature those coffee table books, framed photos and other decorative objects I’ve acquired over the years. Instead of doing floor-to-ceiling shelving, I requested some cabinets below where I could hide things like my camera equipment, stationery and other office-type items. 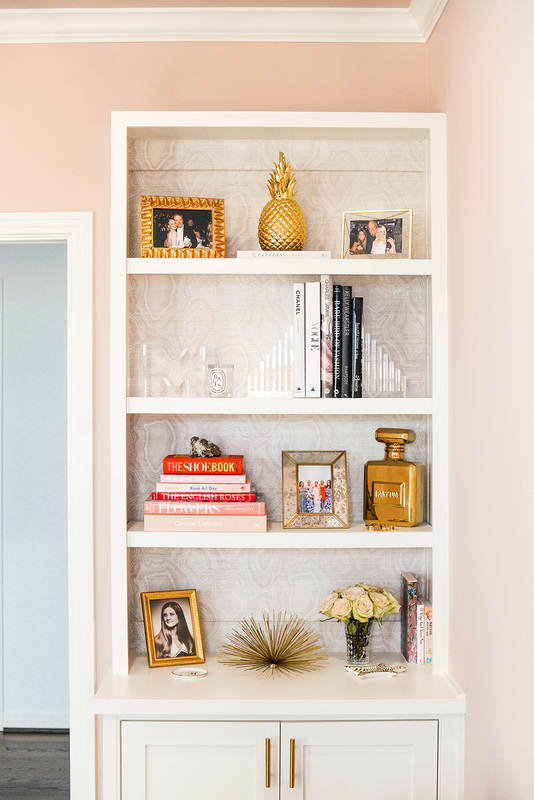 I originally thought I would go with plain white bookcases, until Maddie and I discovered this amazing hemp grasscloth at one of the showrooms in the Design District. I hadn’t yet decided on a wall color either, so the grasscloth was the deciding factor and the reason I went with blush (Sherwin Williams in Sashay Sand). When Maddie first inquired about the fabric, the showroom told her the minimum order would need to be 24 yards – this was way more than we needed and made for a super expensive order, which I really wanted to avoid. Luckily Maddie was able to convince the Phillip Jeffries team to make an exception, and I’m SO glad they accommodated us! I couldn’t be happier with how it turned out and feel like the grasscloth totally makes the room. It’s modern and different, but it’s subtle enough that I know I’ll love it for a long time! So thank you to Phillip Jeffries for helping us out! In addition to my shiny new bookshelves, I should be receiving my credenza today (the first one they tried to deliver was damaged), which will house all of my files and other paperwork. I’m using my glass desk that I’ve had in storage since 2013, and purchased this Parsons desk for my intern to use. I have yet to order drapes for this space, but don’t think I’ll be going the custom route for this room which will luckily cut down on price. Eventually I’d like to add a mirror and maybe more artwork to the space, but those are definitely at the low end of the prioritized list. 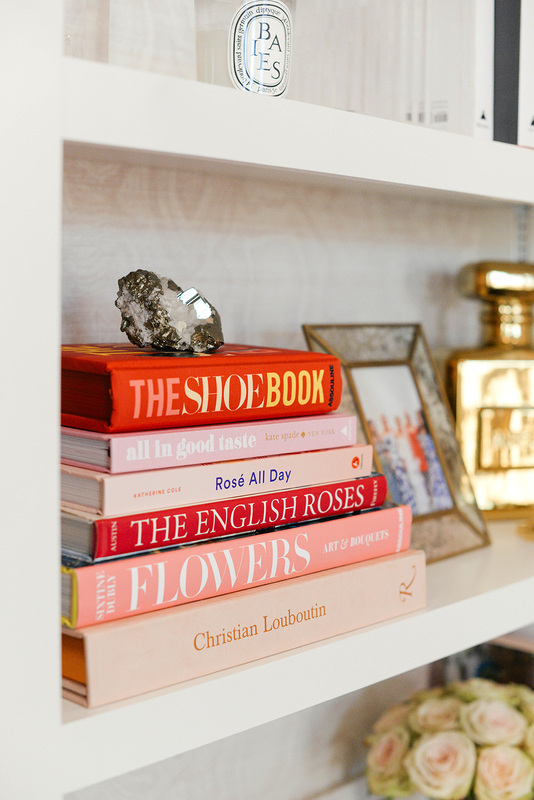 I hope you enjoyed this sneak peek into my most-used space at the new casa! Once I’ve completed decorating the space I’ll be doing a full room reveal with photos from all angles! You can shop nearly everything you see pictured here below – if something isn’t linked it’s because it’s old. Stay tuned for more house and design updates! PS – this may not be the final product for my bookshelf styling. I’m no expert at arranging these things! Hoping Maddie can help me a bit once I get close with the other bookshelf… but I’m doing my best! Shop everything you see in the text section above! It is looking so good! I can’t wait to see more when it is all finalized! I seriously have loved every single piece of your decor and home! Will you do a full home-like every single room reveal post when you complete? I’m so in love and get so much inspiration from your style! I’m so glad to hear it! Yes! I will be doing individual room reveals on here with lots more photos – each room will have a dedicated blog post! I still have a long way to go though, so stay tuned! Looking good Merritt. I like the tones, especially the grasscloth. Can’t wait to see the finished space.